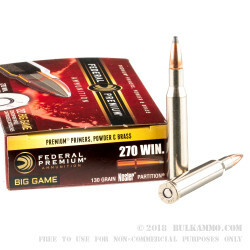 This 270 Win cartridge by Federal Premium sports a 130 grain Nosler Partition projectile. 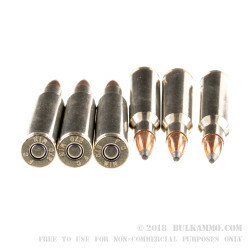 This bullet features front and rear lead-alloy cores that are separated by an integral partition (an extension of the jacket that creates an “H” shape in profile). The front core is exposed at the bullet’s tip, which permits it to mushroom out while being controlled by the bullet’s copper-alloy jacket. The rear core stays intact upon impact, when it retains two thirds of the bullet’s original weight to act as a platform for expansion while promoting deep penetration within the target. 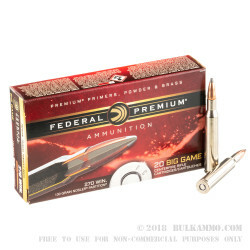 Special crimp locks in this bullet’s base give it additional strength to resist deformation, making this one of the all around best hunting bullets available on the market. 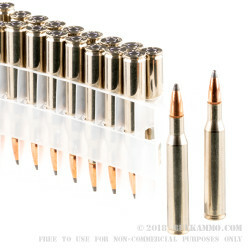 This cartridge also offers a non-corrosive Boxer primed factory fresh brass casing, making it ideal for handloading. You may purchase additional Nosler Partition projectiles, which are available in multiple different weights, for this very purpose.